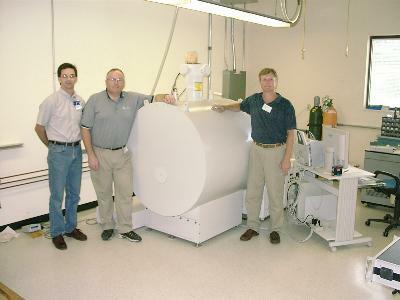 9.4T Actively-Shielded System for Ion Cyclotron Resonance Research - Cryomagnetics, inc.
Cryomagnetics has successfully installed a large bore, 9.4T, actively-shielded superconducting magnet system for Ion Cyclotron Resonance (ICR) research at the Oak Ridge National Laboratory. 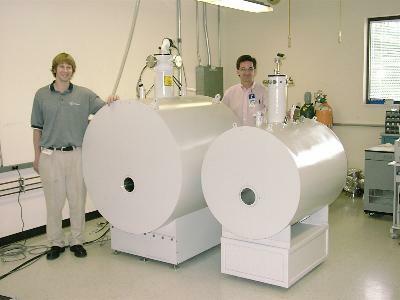 This system is used in conjunction with mass spectrometry equipment manufactured by the IonSpec Corporation. Cold-shippable superconducting magnet systems. Set up time in the customer’s lab is measured in hours instead of days for 4.7T and 7.0T systems. The 9.4T system was set up in only three days! Actively-shielded superconducting magnet systems. Cryomagnetics’ systems can be placed in laboratories that could not handle the size and weight of older design, passively-shielded systems. 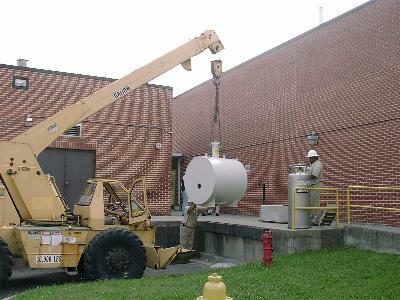 The Cryomagnetics’ 9.4T, actively-shielded superconducting magnet system for ICR research weighs approximately 3,300 pounds. A passively-shielded equivalent can weigh over 25 tons! Cryomagnetics’ 9.4T active-shielded system’s 10-gauss line is approximately 1-meter from magnetic field center in all directions. Cryomagnetics has other development projects underway to improve superconducting magnet systems for ICR. These programs will make possible higher resolution data and simplified magnet operation. Please visit our website often for updates. 9.4T System (at left) and the 7.0T System it is replacing. Note the small size of both systems. These instruments can fit easily in most laboratories. Both systems are actively-shielded with 5.0″ bore diameter. 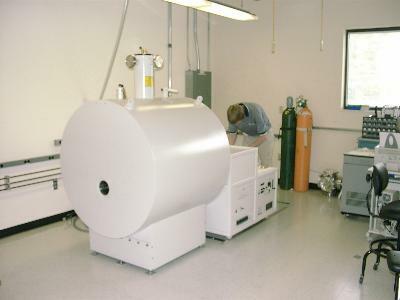 The existing IonSpec equipment was modified for the higher field intensity of the 9.4T system. Contact Cryomagnetics today for further information on all our product lines.